I’m in dire need of a new pair of flats. I currently only have one pair, which means that when flat season really kicks in, I’ll be wearing them basically every day and I think we can all agree that the daily wear and tear just isn’t beneficial for a poor flat’s lifespan. 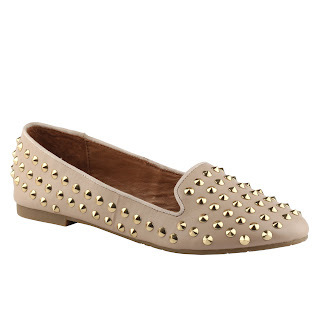 Before I even did any research on the matter (aka online shopping) I decided I wanted a pair of flats that had some type of spikes or studs on them. 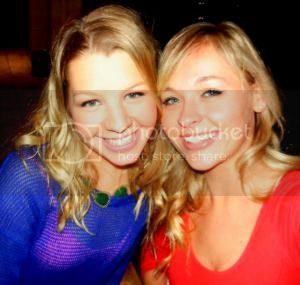 To my pleasant surprise, it’s not a hard thing to find these days! These are beautiful and could be worn for so many different occasions. They have these available in other colors, but these would definitely be my favorite. I like that they’re loafers and the very slight heel. I really like the color and structure on these flats as well the flat, diamond shaped studs focused at the toe. They’re work appropriate, while still casual enough to wear for a day of errands or activities. Personally, I think I’d really like to have a pair of black flats this season since they’re a wardrobe staple that my closet is currently lacking. I love the full coverage of the gold spiky studs. I love that these ballet flats are delicate until you see the edginess at the back. I’m also obsessed with the ankle strap as well as the texture. Heels aren't even necessary to dress up an outfit with flats like these. 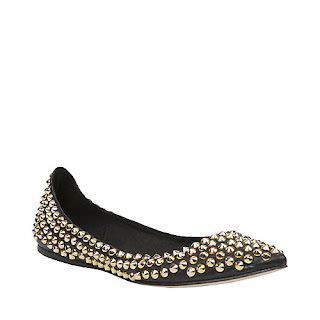 Have you found any flats just radiating with spiky/stud-dy goodness? I’m open to ideas!